Sometimes it can be embarrassing to live in Colorado and have someone visit only to find out that you have never seen all the amazing parts of the state that brought them here in the first place. 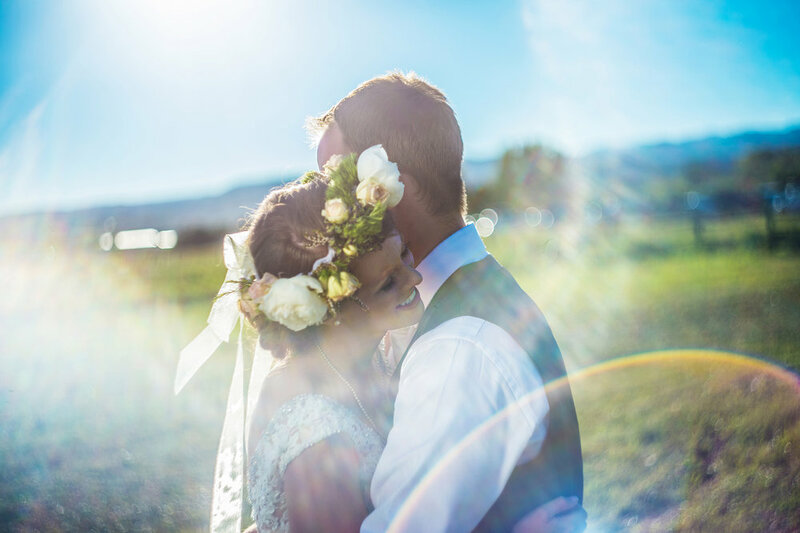 For us, we are saved that embarrassment thanks to destination weddings like our recent one which brought us down south to the beautiful Gunnison, CO. Nearby mountain landscapes, an enormous lake, and best of all, the outdoor wedding of Brandan and Sarahkate. Brandan and Sarahkate were the kinds of folk that know how to make a family celebration, and actually include the family in the celebration. In the "getting ready" portion of the afternoon, both bride and groom were separated into their respective rental houses, and surrounded by bridal party members, parents, and extended relatives so they could all enjoy the afternoon together playing yard games and reminding each other how to hold trains of a dress or tie the formidable Double Windsor. One thing unique to Sarahkate's preparation was her father's involvement at helping her with the veil and accessories. It was both rare and endearing to see a father take so much interest in the role. Perhaps that level of attention to aesthetic detail is genetic, which may explain the beautifully original floral crown Sarahkate donned throughout the whole event - even during the dancing. As any expert party-planner knows, there has to be layered variety involved in order to achieve memorable greatness. Brandan and Sarahkate put together a plan with enough unique elements to keep etsy chatting for quite some time. The wedding in an open field with just a simple arrangement at the altar and the people sitting and standing in a semi circle around them. Piling the entire wedding party into one pick-up to offroad to a nearby bridge over a small creek. Then, to cap off the night's celebration, a bonfire so large that shown bright enough for everyone in its atmosphere to be able to find the s'mores ingredients, and even play another round of yard games. So next time out-of-towners ask if we are familiar with Gunnison, we will say "yes we have been there" and deliver a raving review of the place due to our fond memories of eating cupcakes in the moonlight with Brandan and Sarahkate.